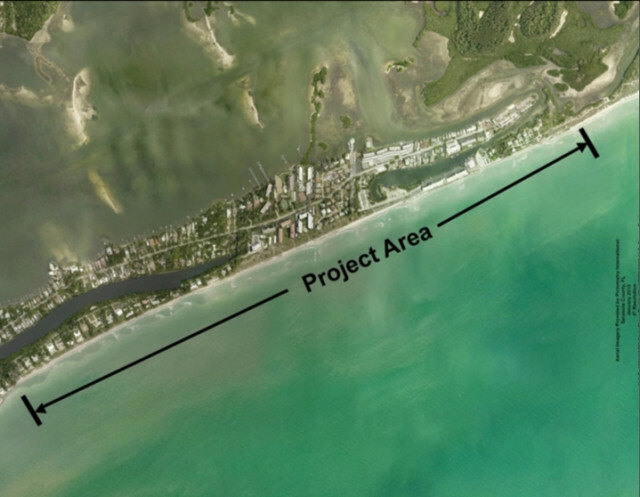 It took only about 10 minutes on Dec. 9 for the Sarasota County Commission to vote unanimously to authorize the second nourishment of an approximately 2-mile stretch of south Siesta Key. The work is expected to begin in January and conclude before sea turtle nesting season begins on May 1, county staff has said. 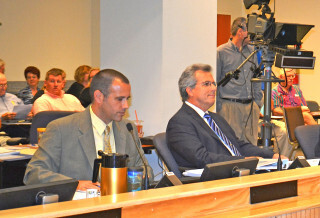 One critical component of the funding for the $21.5 million project is the establishment of a Municipal Service Benefit Unit (MSBU) district, Matt Osterhoudt, senior manager in the county’s Planning and Development Services office, explained to the board during its regular meeting in Sarasota. 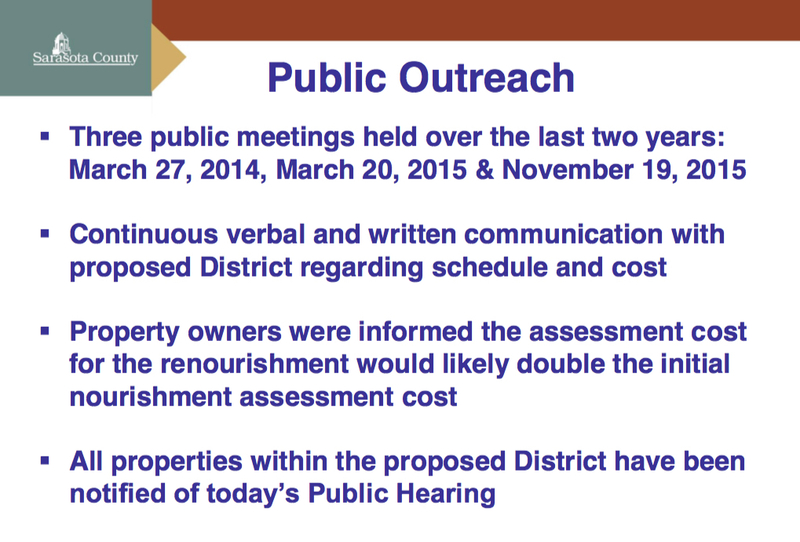 Staff had worked to let the affected property owners know they could end up paying almost twice as much as they did for the original nourishment, which was completed in 2007, Osterhoudt said. Instead, he noted, it appears the increase will be about 80 percent. Roger L. Hettema, a certified general property appraiser in the state of Florida who prepared the necessary MSBU study on the county’s behalf, told the board on Dec. 9 that the expense for most of the landowners on south Siesta Key will be between half a percent and 1 1/2 percent of their assessed property values. The project will enhance those values “by well more than their cost,” he pointed out. According to a Dec. 9 staff memo to the board, the assessments will begin with the residents’ 2017 tax bills and end in 2023, raising $3,536,237. 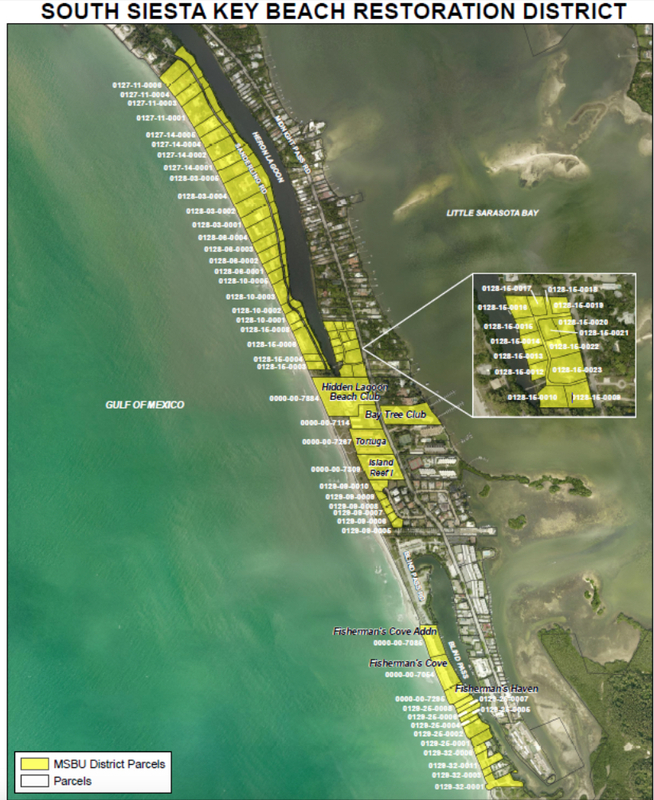 In a written report to the County Commission, dated Nov. 18, Hettema noted that about 81.5 percent of the estimated cost of the South Siesta Key Renourishment Project will be covered by state funds and Tourist Development Tax (TDT) revenue the county has collected and set aside for beach renourishment. Another 1.99 percent of the expense will be covered by carryover MSBU funds remaining from the 2007 nourishment of the south Siesta beach, the report says. Therefore, the property owners in the affected area will be paying for 16.51 percent of the total cost, the report adds. “This is reasonable because of the public lands with public access that will benefit and because the public who do not live along the Gulf [of Mexico] frontage will also benefit from the expanded beach,” the report continues. Part of the board vote on Dec. 9 authorized the borrowing of no more than $3,677,000 from the Florida Local Government Finance Commission to help pay for the project until the MSBU money has been collected. According to documentation provided to the board, the loan is to be repaid by Dec. 1, 2020. Referring to the research he undertook for his report, Hettema pointed out, “The clear majority of studies [regarding nourishment projects in other areas] have all concluded positive benefits on property values of beach nourishment.” Landowners typically realize property value increases ranging from 17 percent to 35 percent, he added. 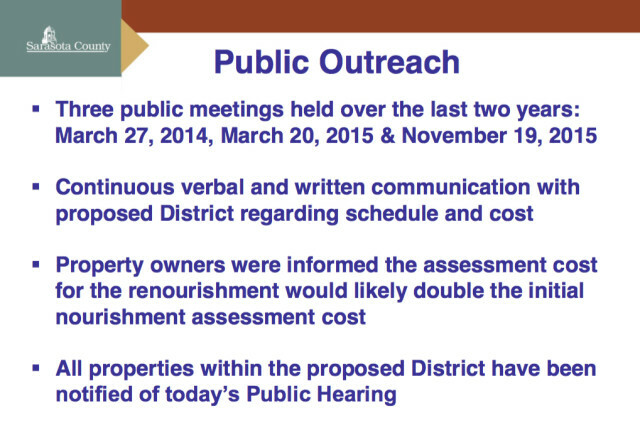 In planning for the project, Osterhoudt pointed out, county staff members made sure to “engage the citizens and receive [their] input,” especially those who would be in the MSBU district. Three public meetings have been held, he noted, and staff members have taken the opportunity to pursue informal conversations as well with the affected landowners. On Dec. 9, the County Commission also approved an $18,101,737.50 contract with Weeks Marine of Covington, LA, for the construction. Osterhoudt said two other firms submitted formal “no bids” for the work. During a Nov. 5 presentation to the Siesta Key Association, county Coastal Resources Manager Laird Wreford pointed out that the number of companies engaged in beach renourishment projects has declined in recent years. That factor, combined with the continuing high demand for such work, has increased the cost, he added. The original estimate for the South Siesta Renourishment Project was $11.5 million, he said. On Dec. 9, the commission also gave a nod to an $837,355.47 contract with Humiston & Moore Engineers of Naples to manage the south Siesta renourishment initiative. Osterhoudt told the board prior to the vote that county staff members have obtained 37 of the 44 temporary construction easements it needs for the work, and they are continuing efforts to secure the rest. That undertaking will not prevent the project from moving forward, he added. Further, Maio continued, it was a “monumental task” for staff to obtain all the necessary permits, given concerns about the sea turtle nesting season and worries that the project could cause harm to a threatened migratory bird known as the red knot. “My compliments to staff on this,” Maio added. 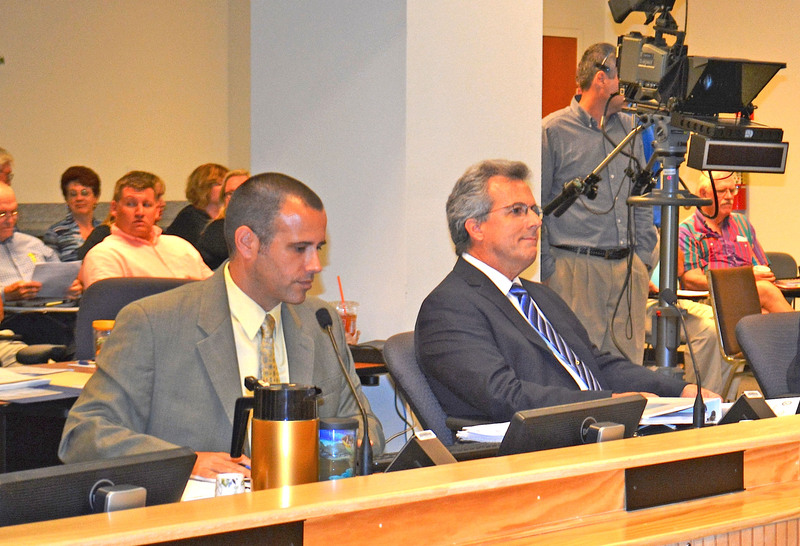 Commissioner Paul Caragiulo seconded Maio’s motion, which passed vote 5-0.